Disabled people and parents with young children are being “shut out of central Edinburgh” by the city’s main bus company after it failed to offer additional accessible spaces on its new vehicles, according to critics. Last week, Lothian Buses unveiled its new double-decker bus which will carry more than 100 passengers when they are rolled out early next year. But despite the capacity increase of around 50 per cent, councillors were left scratching their heads as to why only one space on the buses will be made available for either a wheelchair user or a buggy. 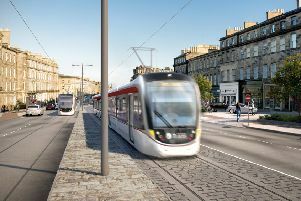 Conservative transport spokesman, Cllr Nick Cook, said: “Moves by Lothian Buses to increase public transport capacity in Edinburgh are to be welcomed. “However, these new buses are a huge missed opportunity, as they continue to provide only one space for either a wheelchair or buggy on board. Such a move gives little reason to be confident that Edinburgh Council’s misguided drive toward banning cards won’t reduce city centre accessibility for the disabled and parents of young children. Green councillors have also raised eyebrows at the lack of wheelchair and pushchair spaces on the new fleet of Enviro400XLB buses. Green Cllr Mary Campbell said: “It’s not so long ago, when my kids were really small, that I faced the regular lottery as to whether there would be enough buggy space on the bus or not. And, of course, that lottery is so much more so for wheelchair and other less mobile passengers. Former Labour councillor, lord provost and transport convener, Lesley Hinds, has also blasted the lack of space for prams. She said: “As a regular Lothian Buses user and a new grandmother I have welcomed the dedicated buggy space in the majority of Lothian Buses. “Recently on the 29 route, new refurbished London buses have been introduced with one dedicated buggy space. I believed this was a only temporary, until new buses were introduced. I was therefore surprised that the new buses have no dedicated buggy space. The company said some but not all its buses have additional space which cab be used for wheelchairs or prams. A Lothian spokeswoman said: “Our new vehicles offer extra capacity for busy routes across our network, carrying up to 131 customers at any one time.